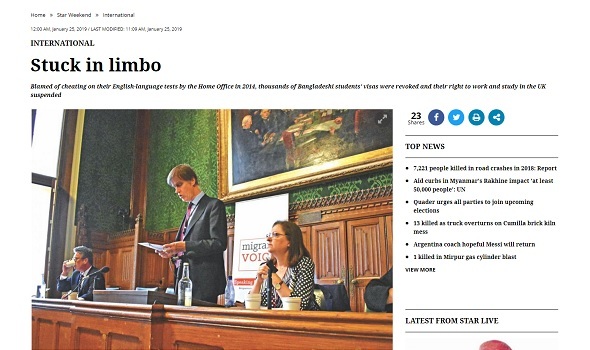 On 24 January 2019, the Daily Star - the biggest English-language newspaper in Bangladesh - published a long report on the international students wrongly accused of cheating by the Home Office. For the article, Maliha Khan interviewed Amin and Waqar, two of the students affected. "Other countries are more welcoming to international students," said Waqar. "Here, we are considered immigrants and that is a big political issue. I came at the wrong time - I became a political tool." "I've told my family that I won't come back until I've seen the end of this," says Amin. "That I tried my best to clear my name."